Nivea is launching a social Christmas campaign this week to encourage people to send personalised gifts to their Facebook friends. The Facebook app, created by Agency Republic, is designed to fit in with the skincare brand's 'Feel Closer' positioning (created by Draftfcb). 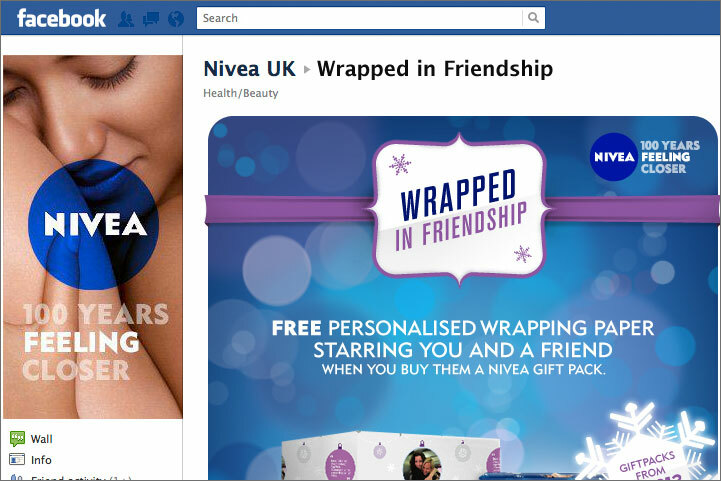 Consumers can use the app to buy and send a friend a Nivea gift set, which will be wrapped in personalised wrapping paper featuring photos they have both been tagged in on Facebook. The free wrapping paper will also include comments they have made on each other's Facebook walls in a strategy that aims to conjure up thoughts the friends have shared and memories of the fun times had together. The Beiersdorf-owned brand first launched its 'Feel Closer' positioning in August in an attempt to shift brand perceptions and re-engage women. It hopes to target women aged 30-54 by encouraging the use of Facebook to share "moments of closeness" by uploading photos and liking, sharing and commenting on other people's pictures.